the leading windows & doors replacement and installation contractor in Western Massachusetts, we would like to wish you and your family a Happy & Safe Thanksgiving. In this 2013 season we are exceptionally thankful for all the business and support we have received from our clients, partners, suppliers, friends & family. We understand that it has been a very difficult season for many individuals and businesses alike. Which is why we have a lot to be thankful for this year. We have been blessed to continue serving in and around Springfield, MA but also around the entire Western Massachusetts area as well as Massachusetts & Connecticut and we are looking forward to the coming years ahead where we can continue to be the trusted windows & doors specialists in our area. And on a daily basis we seek out opportunities to show our work ethic and character to gain your trust. If your looking towards getting your windows and doors replaced or freshly installed give BuildEx Construction a chance. We are also thankful for each current and past client and partner that we have gained over the years. We seek to grow in our success with you and be a company you can depend on. We are confident that you will be absolutely happy you had considered BuildEx Construction in the past, present and/or future to assist with your windows, doors, carpentry, flooring and remodeling needs. If your interested in our services and would like to get a free estimate, we welcome you to take advantage of our Christmas Special by clicking below and getting a 10% holiday discount! BuildEx Construction is a full-service construction company operating out of Springfield, MA. BuildEx Construction Wishes You a Merry Christmas and Happy New Years! Easy Tips For Covering Your Windows! 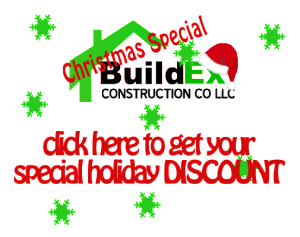 BuildEx Construction’s Holiday Season DISCOUNT! Exterior Stucco Fin Now Available! The BuildEx Difference: Before/After Comparisons! Before and After Comparisons! BuildEx Difference. © 2008 - 2014 BuildEx Construction LLC. All rights reserved.